Having watched you bash the Bishops last week over their concern for the most vulnerable in society, I was heartened to see on your Twitter timeline a Conservative survey to find out what voters are really worried about. After all, no one likes a politician who wears blinkers, or who remains deliberately out of touch do they? I must say though, your survey is quite disappointing. It's worryingly narrow and the language is rather loaded. Take Question 1, where "Welfare (making work pay)" is an option. What does that actually mean? If you really wanted to make work pay, you'd stop subsidising employers by topping up wages with with working benefits.You'd insist on a Living Wage and you'd also challenge all the fibs and myths about benefits, unemployment and the working poor instead of perpetuating them. But I digress. 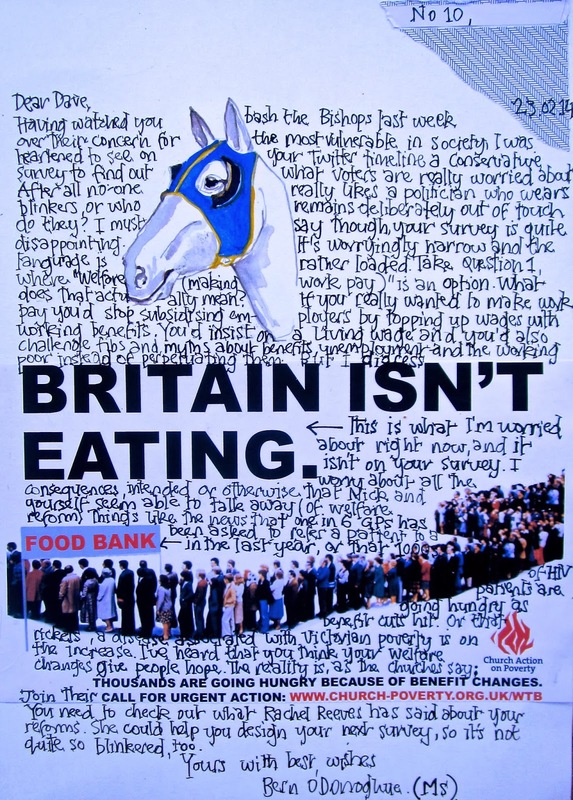 BRITAIN ISN'T EATING <-- This is what I'm worried about right now and it isn't on your survey. I worry about all the consequences, intended or otherwise that Nick and yourself seem able to talk away (of Welfare reform). Things like the news that one in 6 GPs has been asked to refer a patient to a food bank in the last year, or that 1000s of HIV patients are going hungry as benefit cuts hit. Or that rickets, a disease associated with Victorian poverty is on the increase. I've hear that you think your Welfare changes give people hope. The reality is as the Churches say: THOUSANDS ARE GOING HUNGRY BECAUSE OF BENEFIT CHANGES. Join their call for urgent action: www.church-poverty.org.uk/wtb. You need to check out what Rachel Reeves has said about your reforms. She could help you design your next survey, so it's not quite so blinkered, too.